Using System.DirectoryServices.AccountManagement comapred to just using System.DirectoryServices is way much simpler just look at these samples Active Directory and .NET 3.5/4.0 and Active Directory and .NET 2.0 clearly from those .NET3.5/4.0 is straightforward than the other but one thing is missing, exposing other attributes that are not represented in UserPrincipal, GroupPrincipal and ComputerPrincipal. Using the old way you can just do this go get and set the attributes, its really that simple. And if you would compare that to the full attribute set of Active Directory I can safely say this is less than 10% of it, To view a full list you can visit this MSDN (http://msdn.microsoft.com/en-us/library/ms675090%28v=VS.85%29.aspx) or better yet this website (http://www.rlmueller.net/UserAttributes.htm) as it has a really good excel speadsheet that defines each all attributes in a default installation which you can download as well. So the question is how do I expose the other attributes like UserPrincipals mobile, UserPrincipals facsimileTelephoneNumber, GroupPrincipals info, etc. is a sample below on a Group Principal for the “wWWHomePage” attribute etc. Thanks to Principal Extensions! With this, Principals mentioned above can all be extended to create custom objects that extend the object model. These extended classes have now the ability to add or remove properties from the extended class as long as the properties that are added or removed are supported in the directory schema. 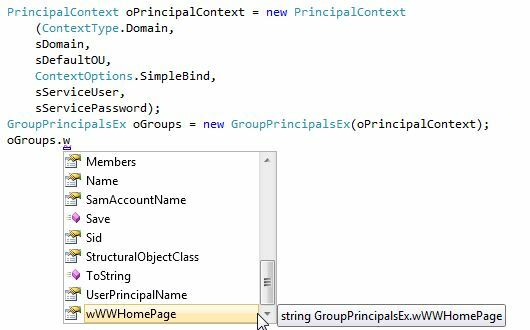 Now to get and set the properties of the extension class you will use the methods ExtensionGet and ExtensionSet and here is a sample below on a Group Principal for the “wWWHomePage” attribute. We call our class GroupPrincipalEx which is the extended class of GroupPrincipal which then exposes the Directory Property “wWWHomePage”. So from the screenshot below you can see that the “wWWHomePage” now is exposed on intellisense. First extend your Group Principal by using the same code above then use PrincipalSearcher to use a Query Filter based on the exposed property. So I guess thats it for now. Can you please show a more detail example of how to use the RemoveUserFromGroup function? Excellent blog post, Thank-you. I’ve run into a similar situation where our AD has the student’s ID # entered as it’s own attribute. Unfortunately I have to search for the student’s username by their studentID in order to get their username. Is this possible? Got it. I was making it harder than it needed to be. 🙂 I just had to make the changes you said and change the DirectoryObjectClass to user and I got results. Thanks very much for putting it all together. Appreciate your time and effort. So if I have a UserPrincipalEx and expose pwdLastSet, would this work? Trying to understand how to get the UserPrincipalEx to be for a specific user without doing what you do in the group example where you are finding a set of groups. I have the user, and I just want to set the pwdLastSet.